Posted on October 13, 2017 - By Fucosoft | Follow YouTube, Twitter to Get More Information. Apple always devoted itself to provide excellent camera in iPhone. Most of iPhone users utilize their phone camera nearly every day to record memorable moments, storing an abundance of photos and videos in iPhone Camera Roll. There are also times, however, mistaken deletion of photos and videos on an iPhone. What’s worse, many other operations also can lead to iPhone photos disappeared, such as jailbreak, failed iOS update, etc. But there’s no need to panic. If you’re troubled by iPhone photos loss and seeking ways to recover deleted photos and videos from iPhone, here is the right place. Below are two options for retrieving deleted photos/videos on iPhone XS, iPhone XS Max, iPhone XR, X, 8/8 Plus, 7/7 Plus, 6s/6s Plus, SE, 6/6 Plus, iPad Pro, iPad Air, iPad mini etc (iOS 12 supported). 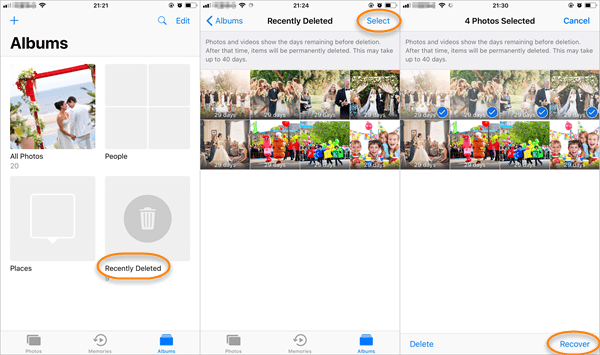 Apple added a Recently Deleted album in Photos App since iOS 8, to help users fix mistaken deletion problem. If you haven’t deleted your photos and videos from the Recently Deleted folder, you can easily restore them back to iPhone Camera Roll. On your iPhone, open the Photos app and tap on “Albums”. Scroll down to find the “Recently Deleted” folder and check if there are photos you want to recover. Tap “Select” in the upper-right corner and choose “Recover All” or individual photos you nee. Afterward, tap on “Recover”. Note: Recently Deleted only keeps deleted photos for 30 days. Once it gets the deadline, they will be removed from Recently Deleted album automatically. And this feature only applies when you deleted a single or small number of photos. If you get entire Camera Roll lost by restoring iDevice, this might not help. 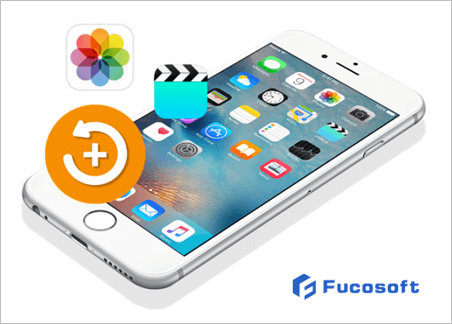 If you can’t find your photos and videos in Recently Deleted album, try third-party tool like Fucosoft iPhone Data Recovery to get your memories back. You can recover deleted pictures and videos directly from iPhone/iPad, or selectively restore from iTunes/iCloud backup (provided you have one). Also, this tool helps to recover deleted messages from iPhone, as well as contacts, WhatsApp, Viber, Kik, notes, reminders, calendar, voice memos and more. Step 1. Download, install and run the iPhone Photo Recovery on your computer. From the primary window, click on “Recover from iOS Device”. Step 2. Connect your iPhone/iPad to the computer via USB cable. Once it is detected by the software, click “Start” to go to next step. Step 3. Now choose “Camera Roll”, “Photo Stream”, “Photo Library”, “App Photos” and “App Videos” from the listed file types, then click “Scan” to begin scanning. Step 4. When the scan stops, you can preview and check all photos and videos in the scan result. Then check the items you want, and click on “Recover” button to save them on your computer. Note: To retrieve deleted photos directly from iPhone, please stop using your iPhone and act the recovery as fast as you can. Any newly added data or operation to your iPhone may cause data overwritten and make deleted photos/videos unrecoverable.